When it comes to Bluetooth technology, hardly anyone does it better than Jabra. They’ve been providing Bluetooth devices of all types for years and now they’ve come up with yet another winner – the Halo Bluetooth wireless headphone. 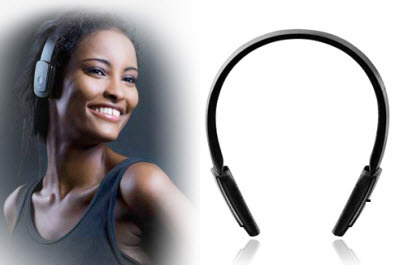 No flashing Bluetooth indicators, just a stylish, sleek headset that delivers great quality sound. Leave your phone in your pocket and control your music right from the headset. Looking at what was wrong with too many other headsets; the Halo addresses and solves these problems in a unique package. TOO BIG TO BE PORTABLE Have you seen those big headphones that take up half your backpack? How practical is that? These are not only flat against your head, they also fold down into a third their open size. A travel case comes included. POOR FOLDING DESIGN Way too many headphones are hinged right in the middle. Hey folks, that’s where the weight rests on the crown of your head. Why would you put a hinge there? Halo folds in three parts so the hinges are off to the sides where there is no pressure. BATTERIES THAT DRAIN Jabra engineered these babies to automatically turn off when the sides are folded in for storage. No more run down batteries when you open them up. To recharge the internal batteries, simply plug into a USB port for 2 hours. CAN’T DECIDE BETWEEN PHONE AND MUSIC Now you don’t have to decide. You can take your calls easily while listening to music on your phone by just pressing a button. The same button works to play or pause your music. Noise Blackout technology with dual microphones create clear voice signals so you can hear and be heard. HARD TO ADJUST THE VOLUME This is one of the slickest design features of the Halo. Simply slide your finger up or down the outside edge of the right headphone to raise or lower the volume. SWITCHING DEVICES Want to use your headphones with a non-Bluetooth MP3 player? No problem. Simply use the micro-USB to 3.5 mm music cable for all non-Bluetooth devices. With Halo, you’ll be tempted to use your phone as your main multimedia center. No wires – how nice! Watch a virtual tour of the Halo here. Jabra Halo headsets are available in your choice of black or black (hmmm), and can be ordered online at Jabra’s website or from Amazon.com.